MILLIGAN COLLEGE, TN (Oct. 21, 2013) — Alumni and friends of Milligan College will return to campus for the college’s Homecoming festivities, Oct. 25-26. The weekend includes a variety of activities, ranging from a musical theater performance to the annual parade and fall festival. The festivities will begin with the dedication of the five new residence halls in the Milligan Housing Village on Friday, Oct. 25, at 1:30 p.m.
At 6:30 p.m. on Friday, several alumni and friends will be honored at the annual “Celebrate Milligan” dinner in Milligan’s McCormick Dining Center in Sutton Hall. Chip Fowler (’73) will receive the Distinguished Alumnus Award. The Hardin “Spirit of Milligan” award will be given to Mignon (Mayfield ’62) Holben. Carolyn Kustanbauter (’73) and Wilbur Reid (’88) will be honored with the Professional Excellence Award. Dustin Barrett (’03) and Bianca Spoto (’04) will be inducted into the Athletics Hall of Fame. Also being recognized with the Heritage Award this year are the Hughston and Cassens families. Another highlight is the annual Associated Ladies for Milligan (ALM) Scholarship “Milligan Buffalo 5K” on Saturday, Oct. 26, at 9 a.m. The 5K features a new route this year and participants will convene at the upper level of Steve Lacy Fieldhouse. Prizes will be awarded to the top male and female in each age group. The registration fee is $15, and the proceeds benefit the ALM Endowment, which permanently provides student scholarships at Milligan. 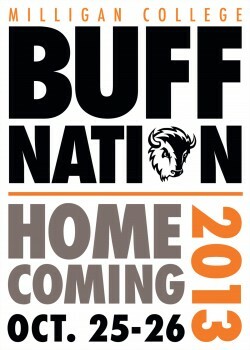 The “Buff Nation Celebration” Parade begins at 2 p.m. on Saturday. The parade route will follow Blowers Boulevard, the main road through campus. The festival on the lawn, complete with inflatable attractions and live music, will be held after the parade from 2:30 to 4:30 p.m. on Derthick Lawn. Other Saturday highlights include an 11 a.m. reception for Michael Kaal, a Milligan alumnus whose photography exhibit, “Coming Home,” opens in the Milligan Art Gallery, located in the lower level of Derthick Hall; a Pardee Hall reunion from 3-4:30 p.m. at the new Milligan Housing Village; and a ticketed “Tailgate Lunch in the Tent” at noon on the Mary Sword Commons. At 1 p.m., Milligan will host a golf tournament fundraiser for the baseball team at the Elizabethton Golf Course. On campus, there will be a 1 p.m. celebration of the 100th anniversary of Milligan’s Hardin Hall. Various sporting events also will be held throughout the weekend. Another main attraction is Milligan’s production of “Godspell,” to be performed Oct. 24, 25, and 26, at 7:30 p.m. and Oct. 27, at 2:30 p.m., in the McGlothin-Street Theatre of Milligan’s Gregory Center for the Liberal Arts. The musical production, based on the Gospel of Matthew and featuring a sparkling score by Stephen Schwartz, is produced and directed by Milligan theatre professor Richard Major, with scenic, lighting and costume design by Pamela Adolphi. Performances are open to the public. General admission is $8; tickets for children, students and senior citizens over 60 are $5. Tickets are available in the Milligan Bookstore or at the box office prior to each performance. After the Oct. 25 performance, ALM will host a cake and coffee reception in Milligan’s Taylor/Phillips House. The reception begins at 9 p.m. Tickets for this event are $15, and reservations may be made by calling 423.461.8710. Proceeds from the reception benefit ALM. All meal events, theater performances, the golf tournament and the walk/run are ticketed events. All others are free and open to the public. The Alumni Office asks that all those who have not registered for Homecoming do so on Saturday, Oct. 26, from 9 a.m. to 2 p.m. in the Gregory Center. For more information and a complete schedule for Homecoming 2013, visit www.milligan.edu/homecoming or call the Alumni Office at 423.461.8718. Posted by tommy on October 21, 2013.